The 1984 NBA World Championship Series was the championship round of the 1983-84 NBA season. In 1984, the Boston Celtics defeated the Los Angeles Lakers in a seven-game Finals, winning Game 7 111-102. Larry Bird averaged 27 points and 14 rebounds a game during the series, earning the award of Finals Most Valuable Player (MVP). Bird was also named the league regular season MVP for that year. This series was the long-awaited rematch of the Los Angeles Lakers and Boston Celtics after their rivalry was revived in 1979 with the Magic Johnson-Larry Bird pair entering the league. After the Lakers won Game 1, a crucial steal in Game 2 led to a tie game and the Celtics were able to win in overtime to tie the series. The Lakers won Game 3 easily and almost won Game 4, but were again thwarted. Now tied 2-2, the Lakers and Celtics each held serve at their home court to send the series to Boston for Game 7. Game 5 was a classic, with Bird coming up with a huge game in one of the (literally) hottest games ever in non-air conditioned Boston Garden. Game 7 was close (indoor temperatures hovered around 91 degrees during the game) but eventually went to the Celtics. Cedric Maxwell scored 24 points against the Los Angeles Lakers in the decisive Game 7 victory. The Series schedule was an odd schedule, due entirely to the whims of television. Game One was played on a Sunday afternoon in Boston, about 36 hours after the Lakers had eliminated the Phoenix Suns in the Western Finals. The teams then had three plus days off, not playing until Thursday night. Then, after Game 3 on Sunday afternoon in Los Angeles, the teams had two plus days off, not playing again until Wednesday night. That in turn started a wearing back-and-forth across the country ... Wednesday night at LA, Friday night at Boston, Sunday afternoon at LA, and Tuesday night at Boston ... to end the series. The following year, the Finals format switched to 2-3-2, where Games 1, 2 , 6 and 7 are hosted by the team with the best record. The change in format came after Red Auerbach complained about the constant travelling during the finals. It was not the famous author George Orwell's 1984. It was June 1984. The proud Boston Celtics franchise has many admirers and loyal fans but they also have many opponents and rivals. Throughout the history of the Boston Celtics several teams have been classified as 'intense rivals', the villains, or as the late Johnny Most would say, 'the other guys in the black hats.' The old Syracuse Nationals, the New York Knickerbockers and the Philadelphia 76ers are just a few foes that come to mind. 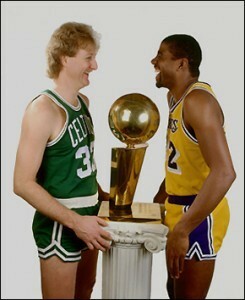 But in the early summer of 1984, the rivalry between the Celtics and the Los Angeles Lakers, perhaps, hit an all-time peak with the seven-game battle for the 1984 NBA world championship trophy.These two brilliant and marquee organizations had not faced off against each other for the championship since 1969 (remember the balloons in theceiling waiting to be released after a Lakers series-clinching victory... that never happened, thanks in part to Don Nelson's "clutch" shooting?). Think back to some of memories and images of 1984: Jack Nicholson being Jack Nicholson; east coast vs. west coast; the 2-2-1-1-1Finals format vs. the 2-3-2 format of today; Showtime vs. Celtics Pride; the chant of, 'Beat L.A.' roaring through the hallowed halls of the Garden; the contrasting broadcast styles of veteran announcers Johnny Most and Chick Hearn; Lakers girls vs. no girls (OK, maybe Louise Boland the team aerobic instructor); two former NBA players K. C. Jones and Pat Riley leading their respective teams; the masterminds of Red Auerbach vs. Jerry West and, of course, Bird vs. Magic. The 1984 NBA Finals was the first Larry Bird vs. Magic Johnson Final. It marked their first meeting for 'all the marbles' since their college days and the 1979 NCAA Championship of Indiana State vs. Michigan State. The Celtics were in the Finals for the 16th time and second stop of the decade of the '80's (winning in 1981 vs. the Houston Rockets), while the Lakers were making their fourth Finals trip of the 1980's (defeating Philadelphia in two of the three series in 1980 and 1982, losing in 1983). 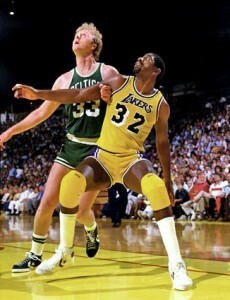 By 1984, Bird and Magic were the two eminent superstars of the sport. Both players led their respective teams to the best record in their respective conferences: Bird and Boston posting a 62-20 regular season slate while Magic and L.A. topped the West with a 54-28 record. To meet in June, the Celtics defeated the Washington Bullets, three games to one, in the first round of the playoffs and then had to 'survive' a seven-game war with the Knicks (that rivalry was renewed after this series), beating New York four-games-to-three. After getting swept by the Milwaukee Bucks in the 1983 NBA Playoffs, the Celtics got revenge and dusted off the Bucks in five games to meet the Lakers. Los Angeles cruised by the Kansas City Kings in three straight, polished off the Dallas Mavericks in five games and in the western finals handed the Phoenix Suns a four-games-to-two setback and the right to meet the Celtics. Bird and Magic may have put a major jolt back into the league and the post-season play, but each player had quality teammates with them. Robert Parish, Cedric Maxwell, Dennis Johnson, Kevin McHale, Danny Ainge, Gerald Henderson, M.L. Carr, Quinn Buckner and Scott Wedman were powerful weapons in K.C. 's arsenal. The Lakers boasted superior talent as well with veteran Kareem Abdul-Jabbar, James Worthy, Byron Scott, Michael Cooper, Kurt Rambis, Bob McAdoo and Jamaal Wilkes providing spark for Riley's purple and gold. If the Boston gang hadn't figured out that things were not going to be easy, in Game One at the Boston Garden (in front of the 168th consecutive sellout) Abdul-Jabbar sky-hooked his way to 32 points (12-17, 8-9) in 35 minutes to give the visitors a 115-109 win and the 1-0 edge. Game Two didn't look all that appealing to the Boston faithful either. Oh, the contest started in good shape, with the Celtics jumping out to a 36-26 first quarter lead. But, with thirteen seconds remaining on the scoreboard the Lakers led 113-111. A two game advantage heading to Los Angeles would be HUGE for the Lakers. But a lobbed Worthy inbound pass under the Celtics basket was quickly snatched up by Henderson who layed it in for two points and a 113 tie! The game proceeded to overtime where Wedman made a key jump shot to put the Celtics in the lead for good. Wedman (10 points), McHale (13 points) and Ainge (12) all came off the bench to give the team the needed lift. In Game Four, the Lakers would shoot .588% (50-85) from the floor, Magic would dish-out another 17 assists (to go with 20 points) and Abdul-Jabbar (32 points) and Worthy (30 points) would lead the scoring attack. So, the Lakers won you say? Remember Bird's parting words in Game Three? With Dennis Johnson now on Magic and a McHale clothesline foul on Rambis, Boston came to play... and win. The Celtics were down by five points in the final minute of play but Bird's jump shot and a steal and breakaway dunk by Carr sealed the win for the Green and White, 129-125 in overtime. Series tied 2-2 and back to Boston. Game Five, June 8, 1984, 90 degrees outside, 97 degrees inside the Boston Garden, which had no air conditioning at all. In this game, Bird was Bird. Game high totals of: 34 points (15-20, 2-2, 2-4), 17 rebounds and 42 minutes of duty pretty much summed it up. But the Celtics could not deliver the knockout punch in Game Six back in Los Angeles. Boston led after each quarter: 33-29 after one, 65-59 at halftime and 87-83 after three quarters of play but were out-scored 36-21 in the final stanza (to lose 119-108) and force a seventh and deciding game in Boston. The glorious 1983-84 Boston Celtics season came to a dramatic and victorious close on June 10, 1984 as the Green and White defeated the Lakers, 111-102, at the Boston Garden to capture their 15th NBA title. The Celtics were spurred on by veteran forward Cedric Maxwell's pre-game proclamation of, 'just hop on my back boys and I'll take you on in". True to his words, 'Max' delivered scoring a team-high 24 points (5-10, 14-17) and adding 8 rebounds and 8 assists in a game-high 43 minutes of work. 'Max' had some help along the way with this game, as eventual Most Valuable Player Bird (20 points and 12 rebounds), Dennis Johnson (22 points and 6 rebounds) and Parish (14 points and a game-high 16 boards) helped to bring the championship hardware back to where it belongs... Boston. In the 70’s, the NBA was a floundering league. That all changed in 1979, when Larry Bird and Magic Johnson entered the NBA. They faced each other in the 1979 NCAA National Championship game with Johnson’s Michigan State Spartans prevailing. Both Bird and Johnson were collegiate stars and there was no reason to believe they wouldn’t flourish in the NBA. Magic and the Lakers captured the 1980 championship against Dr. J and the Sixers. Johnson posted 42 points in the deciding sixth game with team captain Kareem Abdul-Jabbar out. But it wasn’t over the Celtics. Larry who hated to be outdone by Johnson led his Celtics to a championship versus the Houston Rockets in 1981. But it wasn’t over the Lakers. During the ‘83-‘84 season, both teams steamrolled through the regular season. Boston finished number one in the Eastern Conference with a 62-20 record. The Lakers netted 54 victories to post the best record in the west. Bird and the Celtics would knock of Washington, survive the Knicks, and beat the Bucks on route to the Finals. Magic and the Lakers bumped off all their playoff competition in the West. They defeated Kansas City, Dallas, and Phoenix with relative ease. The matchup was now set between the Best of the West, Los Angeles and the Beast from the East, Boston. The NBA was hoping to showcase the ambassadors of the league, Bird and Johnson. CBS broadcasted this epic series between the NBA’s best and the matchup would not disappoint. The Lakers wanted this series in the worst way. During the Celtics dynasty centered by Bill Russell, Boston defeated the Lakers for six of their 11 championships between 1956 and 1969. Magic Johnson was going to do everything in his power to “reverse” this curse. West would not even travel to Boston for the series due to all the heartbreak handed to him by the Celtics. In Game One, Kareem not Magic, would do everything in his power to exorcize all the Boston demons. Abdul Jabbar put in 32 points to lead the Lakers to a 115-109 victory at the Garden. The Lakers already accomplished their goal of splitting in Boston, but they wanted more. Game Two was in the grasp of the Lakers. They held a 2 point lead with only 20 seconds left on the clock. Magic made a rebound of Kevin McHale’s free throw miss and all he had to do was run out the clock. However, he called timeout. Magic and coach, Pat Riley had committed a major miscommunication. Riley instructed Johnson to call timeout if McHale made his free throws not if he missed them. After the timeout, the Celtics face guarded the Lakers and caused a turnover. James Worthy’s pass was stolen by Gerald Henderson and he scored to tie the game. The Celtics would go on to win 124-121 in overtime and Magic Johnson was devastated by his ill advised timeout. The Celtics survived and headed to the LA Forum with the series tied, 1-1. Magic and the Lakers were able to shrug off their Game Two blunders. They destroyed the Celtics 137-104 fueled by 51 fast break points. The Lakers were now up to 2 games to 1 in the best out of seven. The Celtics teammates were sickened by their performance. The Celtics were embarrassed and they needed to circle the wagons. They needed a spark. A pivotal moment. Uncharacteristically, Kevin McHale did just that. With the Celtics trailing 76-70 in Game Four, Kurt Rambis was going in for another fast break layup. McHale clothes lined Rambis and the Laker fell to the ground with a thud. This was the moment the Celtics needed. They needed to prove to the Lakers no basket would be easy. Despite the chippyness, the Lakers still had a 5 point lead and were ready to put the Celtics on the ropes. However, Los Angeles seemed to melt under the physical pressure exerted by the Celts. Bird and Parish combined to erase the deficit and forced the game to overtime. The game came down to last minute. With 35 seconds left, the always dependable Johnson, missed both free throws. His trademark smile was gone. “Mr. Clutch” Larry Bird came down court and hit a jumper to put Boston up by 2, 125-123 with 16 ticks left on the clock. James Worthy now was at the line and could have made up for Magic’s previous misses. But he too buckled under the Celtics suffocating confidence and momentum. He missed both shots and the Celtics won Game Four, 129-125. McHale’s hard foul had fired his team up and shifted the momentum of the series. Back in Boston, Bird took over Game Five. Bird put on a show for the large CBS watching audience. He scored 34 points and hauled in 17 rebounds igniting the Celtics to a 121-103 victory in the pivotal Game Five matchup. It was back to Forum for Game Six with the Celtics holding a 3-2 series lead. The Celtics were physical and thought the Lakers were soft. In Game Six, they would pound and trash talk Los Angeles to no end. With a 6 point lead at halftime, the Celtics were so confident that they broke the Lakers will. They went as far as putting up plastic in their locker room for the celebration (sounds like Game 6 for the Sox versus the Mets in 1986). However, you can never count out great teams and especially great players like Magic Johnson. Magic led his team with 21 points and 10 rebounds to combat Bird’s 28 points. Johnson would not allow the Lakers to lose the championship on their home court. He willed the Lakers to a 119-108 win and knotted the series at 3-3. The NBA couldn’t have asked for a more exciting series to make their league relevant again. The Celtics had history on their side for Game Seven. Boston had NEVER lost a Game Seven at home. And they were not going to start now. The Lakers were already beaten before they even took the court and Magic knew it. The Celtics were loose and ready to hoist another banner to the Garden rafters. Cedric Maxwell led the way by scoring 24 points, 8 rebounds, and 8 assists. Bird was having a mediocre night and ended up with 20 points. The win was not locked up until Dennis Johnson stole the ball from Magic Johnson in the final minute. Bird was able to avenge his NCAA Championship game loss to Magic which ate away at him. The Celtics continued their championship dominance over the Lakers going a perfect 7-0 versus them in the Finals. The takedown of Rambis showed the Lakers that no basket would be a lay up. They would have to claw and scratch for every point. The Celtics’ eastern style of physical play was too much for the finesse Lakers. However, this was just the beginning of the epic battles between Los Angeles in the 1980’s. Both teams would meet again in 1985 and 1987 with the Lakers winning both times. The rivalry between Boston and LA gripped not only the cities involved but a nation. The 1984 Finals broadcast by CBS was the highest rated championship series in NBA history. Bird versus Magic. Boston versus LA. A sports fan’s dream matchup. I can still hear the chant from the Garden…….Beat LA.